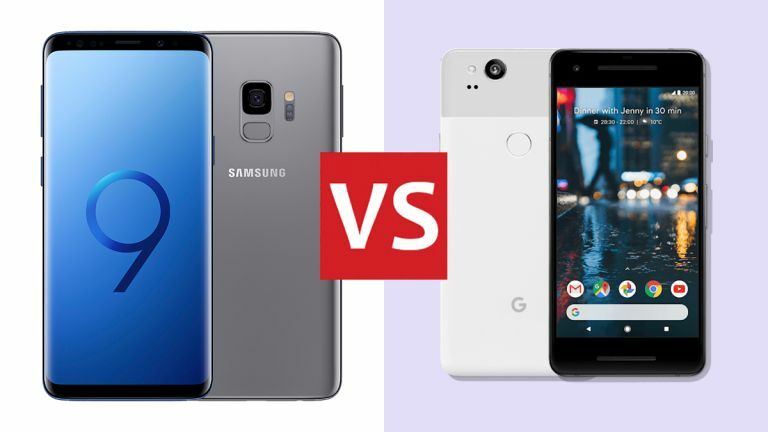 The Samsung Galaxy S9 is one of Samsung's latest high-powered, sleek-looking flagship smartphones – so how does it match up against one of the best phones of late 2017, the Google Pixel 2? We've got all the details you need to know to tell these two phones apart. From the outward design of the handsets to the key internal components installed underneath the casing, read on to get to know these two smartphones intimately – by the time we reach our final verdict you should be sure about which of them you prefer. While you wouldn't describe the Pixel 2 as an ugly phone, its thicker bezels mean that the award for aesthetics has to go to the Galaxy S9: that curved, bezel-free, Infinity Display is just fantastic on the eye, and it's bigger too – 5.8 inches (at 1440 x 2960 pixels) versus 5.0 inches (at 1080 x 1920 pixels). Around the back of the phones we actually prefer the textured, two-tone finish of the Pixel 2, particularly if you opt for the blue or white edition. It works a little bit better than the glossy back of the Galaxy S9, though your tastes might differ. Elsewhere, all the key ports and components are neatly laid out, though the Google phone does the best job of keeping the fingerprint sensor and rear camera discreetly integrated with the casing. The Samsung handset is more rounded, though, from the screen edges to the device corners, again adding plenty to its stunning looks. We have to give this round to the Galaxy S9, thanks mainly to that display, though the Google design team has done a decent enough job, too. Of course, if you prefer something small enough to use with one hand, the Pixel 2 may suit you better. The Google Pixel 2 uses the top-end chipset of 2017, the Qualcomm Snapdragon 835, whereas the Samsung Galaxy S9 goes for its 2018 successor, the Snapdragon 845 (or the Exynos 9810 in some regions). Both phones match up with 4GB of RAM and 64GB or 128GB storage options, but the Samsung phone also has a 256GB edition, and a memory card slot for adding more. With better on-board graphics, too, the Galaxy S9 is undoubtedly the more powerful phone, even if the Pixel 2 is no slouch. Both handsets will motor very speedily through anything you throw at them – but that said, the Samsung one is likely to stay fast for longer, having launched four months after its rival. Around the back, the Pixel 2 has a 12.2MP camera with an f/1.8 aperture, compared to the 12 MP camera on the S9 that can switch between apertures of f/1.5 and f/2.4 depending on your need. With Samsung's dual aperture, and Google's intelligent image processing, it's hard to split them in the camera department – both produce fantastic results. The S9 has a larger battery (3,000mAh vs 2,700mAh), but then it does have a bigger, higher resolution display to power, so again it's pretty much even in the battery life department. Once you get past the main chipset being used on these phones, they're both evenly matched in terms of specs. In terms of waterproofing, the Galaxy S9 is IP68 rated whereas the Pixel 2 makes do with IP67 – in other words the Samsung phone can survive a longer dunk in deeper water, which is something else to bear in mind if you're choosing between these phones. So is the super slow-motion video mode available on the Samsung Galaxy S9: an incredible 960 frames-per-second if you go down to a 720p resolution. The Pixel 2 video recording tops out at 240fps with a 720p resolution, so serious movie makers might prefer the Samsung model. In Google's favour, the Pixel 2 is of course guaranteed to get future updates much faster than the Galaxy S9. Currently, Samsung can be several months behind Google when it comes to pushing out new versions of Android, and you don't have the clutter of all those extra Samsung apps when you go Google. If you want to use some traditional 3.5mm wired headphones, though, go with the Galaxy phone – the Pixel 2 doesn't have a standard headphone jack, making do with a single USB-C connector. You'll have to use wireless headphones, new USB-C headphones, or embrace the dongle life to get your old headphones connected (an adapter is included in the box). The Galaxy S9 was launched in February 2018, whereas the Google Pixel 2 appeared in October 2017, and so you would expect the Google phone to lag behind in some areas – and indeed that's the case. In terms of performance and power, the Galaxy S9 has the edge between these two phones. It's also the better-looking handset, with that large, high-resolution Infinity Display, and barely any bezels at all around the screen. That doesn't mean there aren't any reasons to choose the Pixel 2: It's compact and well built, and has a fantastic camera, not to mention first dibs on Android software updates pushed out by Google. You can also pick it up for less money – Google fans and the small-handed may well prefer it. These are both very good phones and two of the best handsets you can buy right now. Overall, the Samsung Galaxy S9 just edges the contest, but the Google Pixel 2 has a lot going for it as well, particularly on the camera and software side.